No out of pocket charge for children prior to their 19th birthday with a valid Care Card. We bill direct on your behalf in most cases. Participating plans include Great West Life, Sun Life Financial, Manulife Financial, Desjardin and many more. 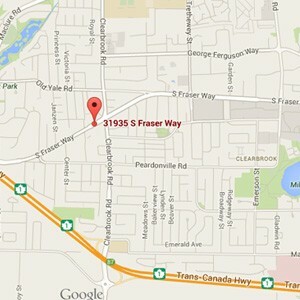 Eye Exams in Vancouver and Abbotsford. 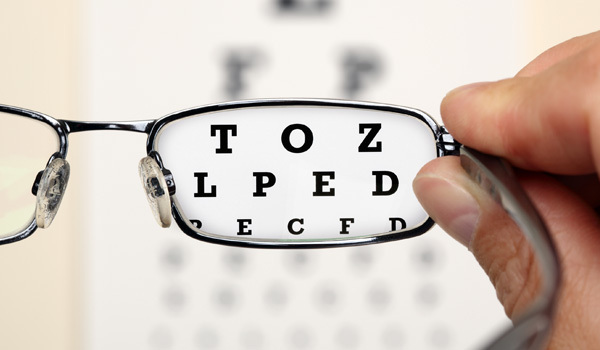 The pre examination is just the gathering up of information, so you will be greeted by our receptionist, our optometric assistants and they will gather your personal information your ocular and general history, any special visual needs or any problems you might be having with your vision any concerns you might have. Then there is section called pre testing which consists of five tests in our clinic. And I say in our clinic because every clinic is different. Me and my associates this is the protocol or pattern we follow during the examination here, you might have different experiences at different locations. So the pre testing consists of five tests. The Auto Refractor and the Auto-Kerratometer, then there is the Tonometer, then the Lensometry test and the colour vision and depth perception test. The Depth Perception test is important for us to check if the current prescription you have, the one you came in with, are the eyes working well together is it providing you with the depth perception you need. The colour vision test is very important because one in eight males and one in two hundred females have colour deficiencies so we need to test for that. The Lensometer measures the prescription in your current pair of glasses, whether they are single vision, bifocal or progressive. The Tonometer is a test, you are going to feel a small puff of air, it measures the internal pressure of your eye, it say test for Glaucoma, it doesn’t diagnosis it or rule it out totally but it give us some insight, so it’s a very important test. If you have Glaucoma, you won’t know you have it, and it can lead to blindness. The first test which I told you about, the Auto-Refractor and the Auto Kerratometer gives us a starting point for your prescription. It tells us if you are near cited , far cited, if you have any Astigmatism. The Auto-Kerratometer part of this machine measures the curvature of your cornea, which is important for us to know what curvature for contact lenses to use for you. So it helps us with our contact lens fitting. Once all this information is gathered the optometric assistant or the receptionist will record it. This video will not talk about the importance of the eye exam or how often you should have your eyes checked. This video shows Dr Parm Sandhu demonstrating the Edger, which is used to make eyeglasses. Then we move into the actual examination. The actual examination with me and my associates starts with going into more detail, what is the reason for your visit, what your history is with your eyes or your general history, and go into more details what your current needs are. 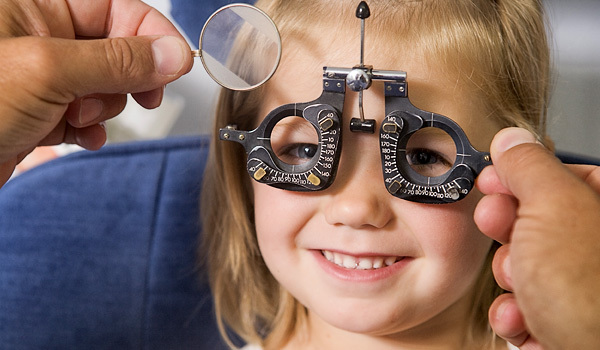 Once we know those needs we start the testing part of the exam, which consists of refraction, binocular testing and then ocular health. Refraction starts with measuring your visual acuity, using the projector and chart to measure what your acuity is without any correction, with your current correction regardless if it is glasses or contact lenses. Then we do the refraction using the Phoropter and the chart to measure what prescription you need for distance vision, intermediate, which is mainly computer for most people, and near. The near is especially important for people over forty, thats when presbyopia sets in and we have near vision problems. So that part measures the prescription at all three distances. The binocular testing is important, this prescription may make each separate eye see well, but do the two eyes work well together, which is very important again for depth perception, so the binocular part of the testing is done. Then we move into the Eye health part of the examination. We basically divide it into anterior segment and posterior segment, so the front part of the eye and the back of the eye. We use a big microscope called the Slit Lamp, along with high powered lenses to take a look first the anterior segment your lids, your lashes, the white part, the conjunctiva, the cornea, the pupil, the iris. These are all important because these affect the comfort of your eyes, whether your eyes are dry, numerous issues can cause discomfort during the daytime, dry eyes, blinking to much, certain types of eye infections, lid infections. Then we look at the posterior part of the eye, again with the big microscope, with high powered lenses, we have a retinal camera which can take a picture of the front and back of the eye. So it takes a picture of the back of the eye through an undilated pupil. Basically what it does is focuses through the pupil and takes a picture of the optic nerve and the retina. So it is able to asses any optic nerve abnormalities, diabetic related changes. Which is very important because diabetes is the leading cause of blindness. The optic nerve when someone has glaucoma, starting of the Glaucoma it affects the optic nerve. Macular degeneration, which is very common in patients over sixy five. Causes your central vision to go down. Even high cholesterol will show up in the back of the eye. These veins and arteries in the retina are the only visible veins and arteries in the body, they are the smallest veins and arteries in your body. These are the veins and arteries that get affected first so systemic diseases affect your body and it shows up in the eye first. So this test is very important. 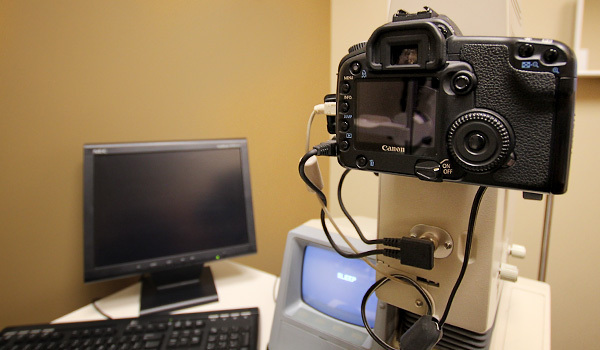 So this camera allows an undilated exam, if we need further assessment due to certain systemic conditions or if you have a high prescription or you have a very small pupil, we do what’s called a dilated examination, which is a bit more intrusive, we put in drops, wait for half an hour, allow the eyes to dilate, again use the machines and high powered lenses to look at the back of the eye. Which can help us look at the Peripheral retinal, if there is any retinal holes or retinal tears so we can make that assessment. Then we move to post examination. Post examination is divided into discussion and then action. All these findings are gathered, recorded and we discuss these findings with you. If it is some eye health issue, we are going to discuss how we are going to manage this. So if you need a prescription for something to treat your eye health issues, we will recommend that, if we need an appointment with an eye specialist known as an ophthalmologist depending on what your condition is, if it’s Glaucoma we are going to send you to a Glaucoma specialist, if it’s Cataract assessment or surgery we are going to refer you to who we feel is the best Cataract Surgeon. If it’s retinal issues you are going to go to a Retinal specialist. 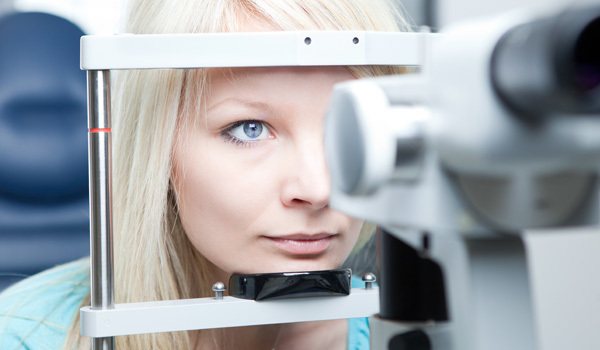 If it is a general eye issue, there is a general Opthamologist which we deal with. If the recommendation is that there is vision issue, regardless if the treatment is glasses, sun glasses, contact lenses or laser surgery we will discuss that with you. 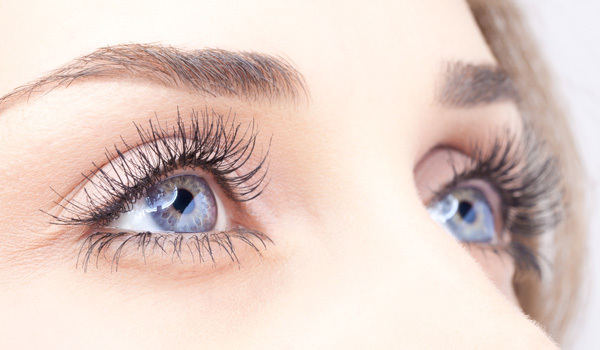 If it’s Laser we are going to recommend an Opthamologist or eye surgeon laser centre which we feel is the best in town and who we have worked with for years. If it’s contact lenses, me and my associates do all of our contact lens fittings all of our contact lens recommendations and follow ups with you. There is lots of new contact lenses out there, single vision for astigmatism, multi-focal, (multifocal) so we will do that with you. So if the recommendation is glasses or sun glasses me and my associate will take you from the examination room to the dispensing area introduce you to our optical sales person and frame stylists and recommend the specific lenses which we feel that you may need, regardless if they are single vision, bi-focal or progressive lenses. All single vision, bi-focals and progressives, now with technology there is digital forms of these. There are a lot of options. We basically narrow those options for you so you can make a good decision. We have a vast dispensary with all types of designer names exclusive brands, we carry a good selection. These are all current frames with good warranties, minimum 1 year. So then you decide with the optometrist and frame stylist what you want and we can start the process of taking care of your visual needs. So come and feel, see and live the EyeMax Experience, see life to the max! 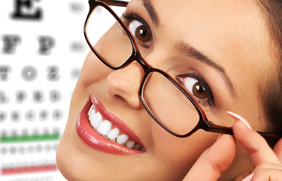 We specialize in offering exceptional customer service, quality eyecare and the latest in designer eyewear. 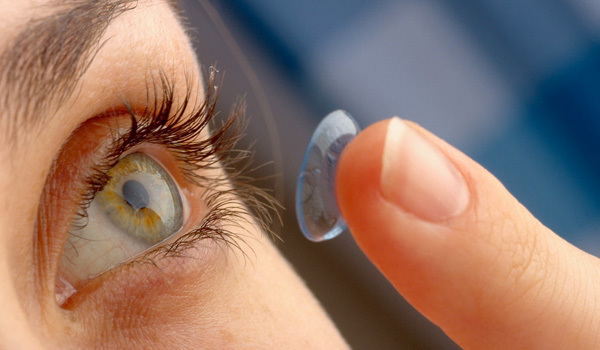 At EyeMax Eyecare we provide one on one contact lens training to ensure proper insertion, removal and cleaning techniques. Your trained contact lens fitter can discuss your personal needs with the prescribing doctor should you have any concerns. 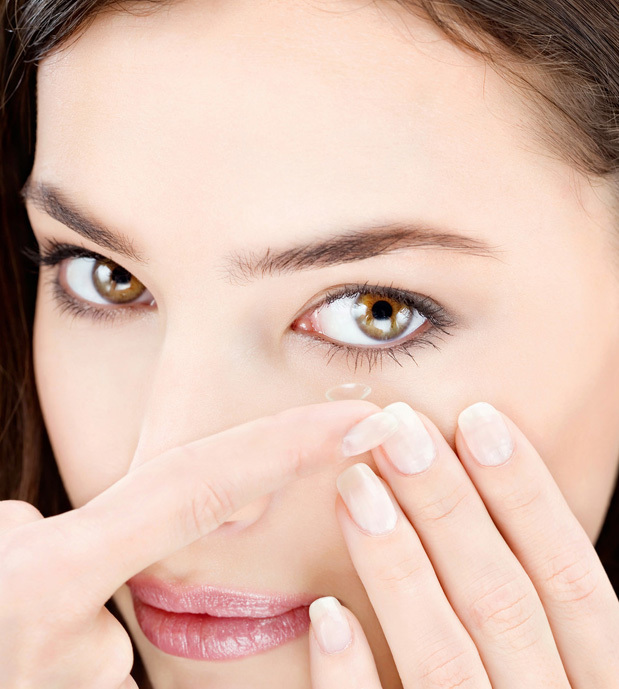 We also want to ensure both the contact lenses and solution you purchase are the perfect match for your eyes. Since no two lenses or solutions are completely alike we provide you with a no charge follow up visit to see your optometrist and evaluate the progress after you have had time to try the new lenses..
We also guarantee your contact lens prescription for one year from the date of your final fitting. If at any time during that year your prescription changes we will be happy to exchange any unused contact lenses for a set in your new prescription. Also we will keep all your personal contact lens history on file so we are able to decipher any problems you may have more efficiently than if you had ordered on-line with no record of previously used products. 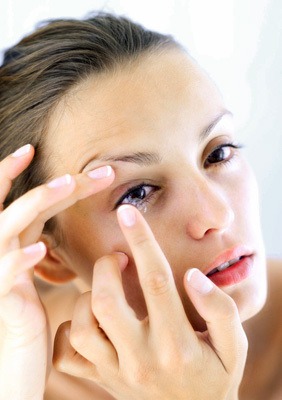 We always offer all contact lens brands from soft disposables to Rigid Gas Permeable. 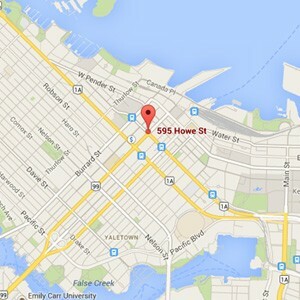 Can’t make it down to the office? We can ship your contacts directly to your home or office at no additional cost to you. 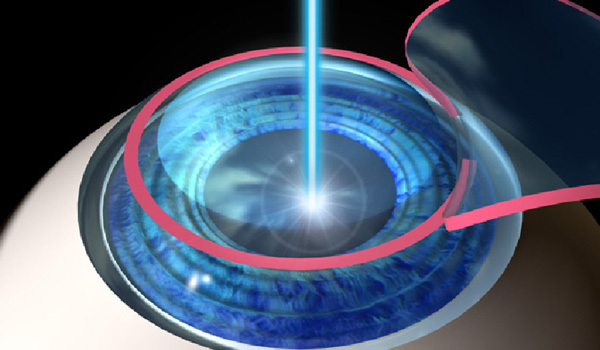 At EyeMax EyeCare we offer full Laser Vision referral and consultation services. We work with some of the best local surgeons and can perform the tests required for a referral to them. 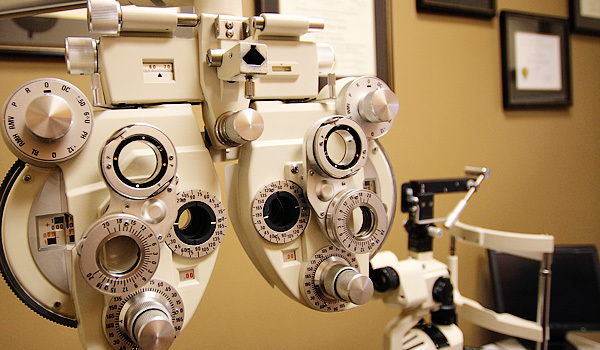 The EyeMax EyeCare team is able to talk with you about the different procedures available and prepare you for what to expect during the entire process. We provide full pre-operative and post-operative services.